HELLO AGAIN. It’s time for another check-in (and door prizes!). Most likely, I (Kristen) am just waking up because my dogs were too cuddly and warm and leaving my bed seemed difficult, and I’m stumbling into the shower to become human. Rachel doesn’t move until she coffees, I don’t coffee until I shower. Kerry has usually run 30 miles or something by now. We all have our morning processes. Now that I’m awake, I’ll say good morning! We’re about 20% of the way through this thing, and it’s All. Going. Great. How do I know that?! You’re here, you’re reading, and those are two of my favorite things. This readathon means a lot to me, and watching it grown and morph into an even better version of itself every year is one of my greatest joys. What are you reading? How are you doing? Are you just getting started, or rolling on into hour nine like a champ? 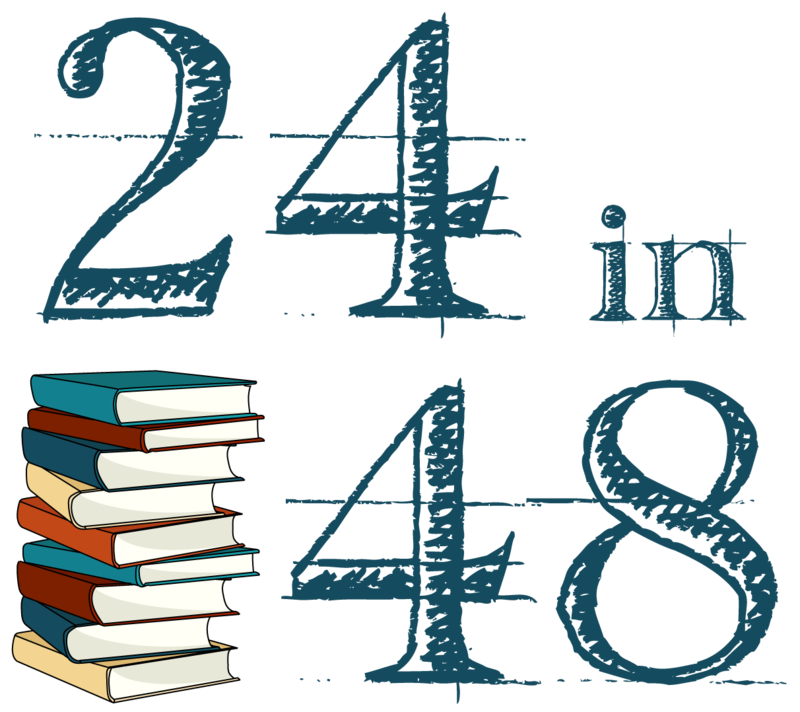 Let us know in the comments, or tag us in a post on social media using #24in48! Also, don’t forget to complete the Hour 6 Reading Nostalgia Challenge (winner announced in Hour 12! ), and I’m gonna give y’all another reminder about the Intro Survey! And now…the door prize winners! Head on over to the prize page to claim your loot! I am currently 4 hours and 14 minutes in and have less than 100 pages left in my book. I am reading An Echo Through the Snow by Andrea Thalasinos. So much fun! I’m up and at ‘em. I took a short nap but have been back at it for an hour. I am currently reading a book called Bird of Paradise written by a local Tulsa author who happens to be a friend. I’ve got my breakfast and third cup of coffee by me and am moving on! I’m reading As Bright As Heaven by Susan Meissner and I’ve read for an hour and 10 minutes so far but it’s only 8:15am. Good luck everyone! I just woke up. I read 37 minutes last night. Hopefully I’ll be finishin magic study! I’m about two hours into reading, and about to finish my first read — A Streetcar Named Desire. This play has been on my list for so long! I woke up earlier than planned so my count is at 3 and half hours so far. I’m reading “Are you there God, It’s Me Margaret” and “Me, My Hair, And I”. Back to reading :)! I just got up, heading over to Starbucks and then I am headed home to pick out my first read. I still haven’t made a tbr yet. I’m slowly getting started this morning. Just went over the hour mark and I’m reading The Murder of Roger Ackroyd for my first book. Good morning! I woke up at 5am and am at 1 hour so far. I am re-reading the Harry Potter series and am on Book 4. I’m also reading A Prayer for Owen Meany. This is fun! I started reading at 230 am im 22 percent into my book The Breakdown…sooo good! I have 20 hours and 40 min to go! 8 1/2 hours in and really enjoying it!! Have read a little over seven hours now. About halfway through my physical book and almost done with my audiobook. Doing some sleeping and a little reading but will gear up slowly. the cold is not my friend after living in Mexico and now, living back in Delaware. Into the 100’s of Bury My Heart At Wounded Knee, a long way to go! I just managed to read an hour last night before I fell asleep. Now it’s time for breakfast and books. I am almost 5 hours in and have read 160 pages. On hour 4 of reading so far. Finished two books and started another. Just switched to an audiobook to rest my eyes. I’m determined to make it to 24 hours this time!!! Stayed up until 2 AM so I’m just waking, but excited. I am reading Dark Matter and The Sound of Gravel! I read 3 hours last night. Got one small book finished that I had already started. I got a little sleep. Now I am about to start up reading again and finish up a second (average sized) book that I also had already started before the challenge started. On hour 4 and still on my first book, less than 60 pages to go. I’m on the other side of the world, so it’s past midnight now. Two hours into the challenges and started with Scorched by Mari Mancusi. Just pauses for a lunch break and then will finish the last few chapters! Started with Wedding Cake Murder earlier this morning, and just finished an audible listen if Nick Offerman’s Paddle Your Own Canoe. Love his hilarious but real nature! I was quite fresh till the 8th hour and then sleeplessness and hunger pangs kicked in &I cooked myself a delicious french toast. I started with non fiction and managed to finish 1/4th of it and then tackled Night Circus by Erin Morgenstern and read some 202 pages. Now starting with the third book, ‘The Bear and The Nightingale’ by Katherine Arden. I started with non fiction and managed to finish 1/4th of it and then tackled Night Circus by Erin Morgenstern and read some 202 pages.